Yesterday evening(November 18th) Suki Waterhouse attended the 2018 Evening Standard Theatre Awards at the Theatre Royal in London. BROCK COLLECTION continues to be a celeb favorite on the red carpet as Suki chose the fashion label for her outing. 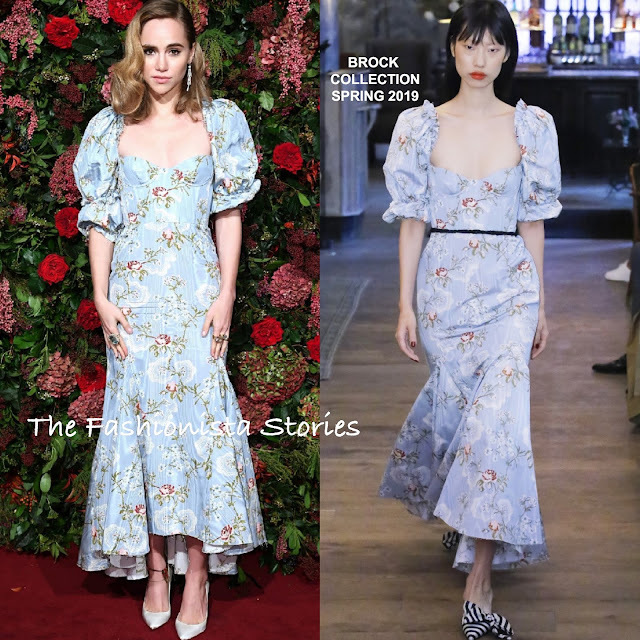 She wore the SPRING 2019 'Olaya' blue floral dress, featuring blouson three-quarter sleeves, a tie cutout back and ruffle hem. On the runway, Suki's dress was adorned with a contrasting black rope belt at the waist. However I don't think she needed it. While I wish the hair was sleeker & off-the-shoulders, I do love her like her side parted, light wavy do. A selection of statement rings and CHRISTIAN LOUBOUTIN pumps finished up her look.